Biggest accomplishments were escaping Portland for someplace where I can be outdoors in spring without endangering my health, and unloading the condo I have there (which I guess could be regarded as a subset of the first, but I hadn’t actually lived there for some time). I’m still unemployed, but that’s not a terribly big surprise. Once I had gone about a month without locating work, I pretty much knew it was going to be a long, hard slog, because I never have any middle ground in this regard; gaps between jobs seem to either be inconveniently long or too short to offer any time to recharge. … when reading a Craigslist job posting titled “PHP Programmer & Fine-Code Connoisseur // $110,000 (Seattle)”. PHP is a textbook example of the hazards of someone who has insufficiently studied language design designing a language. No genuine “fine-code connoisseur” would want to touch PHP with a 10-foot pole. The unrealistic salary indicates that it’s a pretty transparent example of a sleazy recruiter trolling for résumés. PHP jobs tend to pay less than those using most other platforms, precisely because anyone with enough smarts to be a good programmer doesn’t want to touch the language. Of course I made a point to listen to (and record) Voice of Korea today. The executive summary of the broadcast is given in the title; the “news” pretty much followed that summary to a ‘t’, segueing from an eulogy of the “Great Leader” to praise for the “Great Successor”. Unwittingly, the station in that land of shortages and hardship for the vast majority of its people also gave Kim Jong-Il a most appropriate send-off, being interrupted twice by power cuts. At least, that’s what I assume they were because both transmitters went off the air simultaneously each time. The edited (I deleted the static during the total of 11 minutes and 46 seconds of dead air in the two interruptions) audio may be found here. If for some reason you want to hear everything in real-time, breaks in transmission and all, that audio may be found here. Note that if you’re not that interested in hearing the two praise songs (one to Kim Il-Sung, one to Kim Jong-Il) that start each broadcast, the main “news” broadcast starts about 7 minutes and 50 seconds in. Did Iran Bring that Drone Down? Both sides have every reason to lie and make the claims they are making. Admitting Iran did bring the drone down would be embarrassing for the USA, so of course Iran is going to assert they brought it down and the USA is going to assert Iran just got lucky when the drone came down due to a malfunction. Regarding the latter claim, it’s interesting to note that the assertion US drones are often programmed to land if they lose communications is a statement consistent with both sides’ claims. It obviously lends credence to the US claim, as it explains why Iran was able to retrieve the drone intact as opposed to scoring only a few bits of charred debris. It also lends credence to Iran’s claim. First, any communications for controlling the drone would obviously be very securely encrypted. Managing to crack such encryption in real time is highly unlikely. That leaves Iran with the option of simply jamming the control signal, by using high-powered transmitters to overwhelm it. If a drone is programmed to land when it loses contact, then jamming its communications link is effectively sending it a command to land. Note, however, that such jamming is hardly (as Iran claims) “sophisticated;” to the contrary, it is rather crude and brute force measure. The only truly sophisticated technology Iran needs is a radar system capable of circumventing whatever anti-radar measures US drones typically have, so that such drones can be detected and intercepted. Interestingly, Iran claimed to have acquired precisely that capability last October. At this point, however, it’s strictly a “he said, she said” story. What would definitively lend credibility to Iran’s claims is for a second drone to be captured by them in say the next six months. Such a feat would be more than can be explained simply by getting lucky. Having noticed how local public radio station KUOW has some interesting-sounding programming on their HD radio subchannels, I did a little Google searching and found an HD tuner (new in the box) being offered for the somewhat astounding sum of $40. I did some research on the seller, and found her to be highly rated, so I decided to order it as a Christmas present for myself. I was somewhat floored to find a box containing my purchase sitting on my doorstep this afternoon. I had not paid extra for rush shipping, and the quoted delivery time for non-rush shipping was as much as 4 weeks in the future. And it was as described: new, in unopened packaging. Alas, HD radio itself proved to be as big a disappointment as the vendor who sold it was a pleasant surprise. HD is a subcarrier-based system, so it works basically like stereo FM signals: only the stronger signals present solid stereo reception, and only the stronger signals come in on HD. But, HD is even more fussy than the stereo subcarrier; you need a really solid, strong signal to get HD. Forget any sort of indoor antenna, you need something on the roof. The only station I could reliably get in HD with an indoor antenna was the one I could care the least about receiving: the local right-wing Christian station. I had no luck getting an HD signal for KUOW, despite being able to get a fairly solid stereo signal on that station with an indoor antenna. It’s presently not worth my scarce time and money to fuss with erecting an external antenna on the roof, particularly such a steep roof as the house I’m currently residing in as. So much for that experiment; glad I didn’t throw more than $40 at it. One thing that never ceases to amaze me is just how absolutely moronically most IT departments make decisions. We’re not talking about anything the least bit utopian or radical here; we’re just talking about the sort of stuff that any capitalist business should logically be expected to jump on and implement immediately, presuming capitalism is about profit maximization. Because any of this stuff will obviously help maximize profits by making one’s workers work more efficiently. But no: politely and respectfully suggest that you would, for example, like a Mac on your desk because you work more efficiently with Macs, and odds are the typical IT manager will bite your head off: either there’s a “standard” (and Macs aren’t it), or Macs are “too expensive” (not by very much, particularly when you compare hardware costs to IT labor costs), or some other rationale that is quite frankly absolute horseshit. Ditto for things like simple requests to be moved to a more quiet or dark (screen glare can be nasty) part of the office which nobody else is currently using. Really, now: you’re hiring IT professionals because you don’t have the time or the skills to do the IT work yourself, then you turn around and ignore what they tell you in their best judgement as IT professionals will improve their productivity? It just doesn’t make sense. So choice of computer hardware is one of the questions I try to ask on interviews, because it helps screen out the morons I don’t want to work for. Because thankfully not all managers are abject morons. Some even have adopted the common-sense approach of simply giving each IT worker a budget to spend as s/he chooses on a workstation. What astounds me is how rare (relatively speaking) that approach is. It all goes to show how capitalism is about more than just making money. Hierarchy and control, and the desire for authoritarian personalities to exercise it over others, figures very big in the equation. A few days ago, I went on a brief test “DXpedition” to an area about 1/3 of a mile south from where I live. It’s an open area without many buildings or power lines not far from the summit of Seattle’s highest hill. I thought it might offer better listening conditions. I was right; the noise floor is dramatically lower than it is here. Note that I’m no longer using yourlisten.com to host audio and this blog unfortunately does not stream audio. Hopefully I can get it to do that without much trouble; we’ll see. I will say that I’m probably finished with yourlisten; their advertising has been getting more and more annoying and in-your-face, and their site seems to be getting less reliable as well. Spoor left by a lying UPS truck driver who did not even knock. I thought I had left this sort of crap behind when I left Kings Hill in Portland. I guess the behavior is more widespread than I had thought. Perhaps it’s spreading. From what I’ve heard, UPS is a pretty awful place to work for as a delivery truck driver. Management continually sets unrealistic quotas, and then disciplines drivers for failing to achieve the impossible. 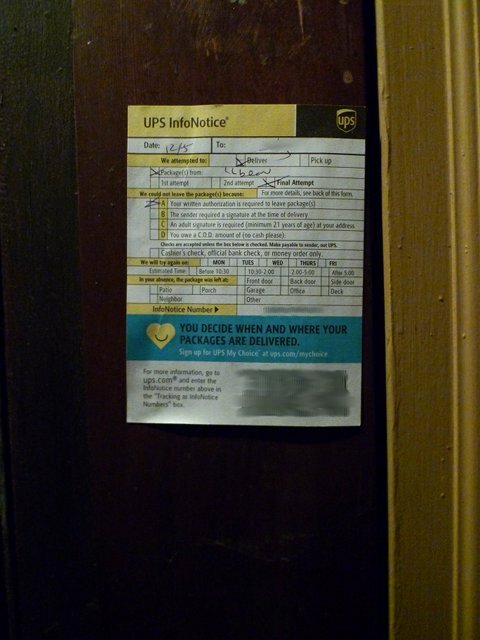 So I guess it’s not a surprise that some drivers are retaliating by filling out batches of UPS spoors during their lunch break, and then shaving time off their routes in half-minute or minute increments by dashing to doors and slapping UPS spoors on them instead of knocking and waiting for someone to answer. I may soon have to revert to my past policy of refusing to accept UPS deliveries. My worry is that since the Postal Service is losing money, some idiot who thinks that capitalists have all the answers will appoint an expert from UPS to “reform” the Postal Service into doing just this sort of crap (first to its letter carriers and then to customers as a logical end outcome). Update: If you Google “ups leave note without knocking”, you will see that I am hardly the only person to have this sort of experience with UPS. Guess it’s back to insisting on Parcel Post of FedEx Ground for me.